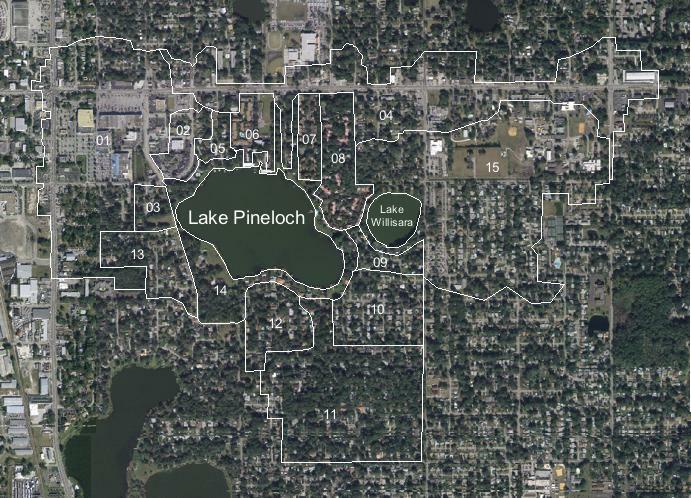 Lake Pineloch is a 66-acre urban lake located south of downtown Orlando. Portions of the drainage basin are located in the City of Orlando as well as unincorporated Orange County. The 505-acre drainage basin is highly developed with a mixture of residential and commercial land use activities, much of which was constructed prior to regulations requiring treatment of stormwater discharges. Historical water quality in Lake Pineloch has been highly variable, ranging from oligotrophic to near-hypereutrophic conditions over the available period of record. A review of historical water quality was conducted to evaluate general water quality characteristics and long term trends. A field monitoring program was conducted by ERD from April-November 2006 to collect hydrologic and water quality data for developing hydrologic and nutrient budgets for the lake. Automatic samplers were installed at four significant stormwater inflows, and flow-weighted composite samples were collected during 8-13 events at each site. Monthly surface water monitoring was conducted including vertical profiles and water quality samples. Bathymetric and muck depth maps were developed. Ten groundwater seepage meters were installed in Lake Pineloch and monitored by ERD over a period of 6 months to establish characteristics of seepage inflow to the lake. Large diameter core samples were collected and incubated under oxic and anoxic conditions to estimate loadings from internal recycling. A hydrologic budget for Lake Pineloch was developed based upon inputs from direct precipitation, stormwater runoff, inter-connected lake inflow, and groundwater seepage. Water quality improvement projects are recommended for Lake Pineloch to target sources identified as significant contributors of phosphorus loadings to the lake. 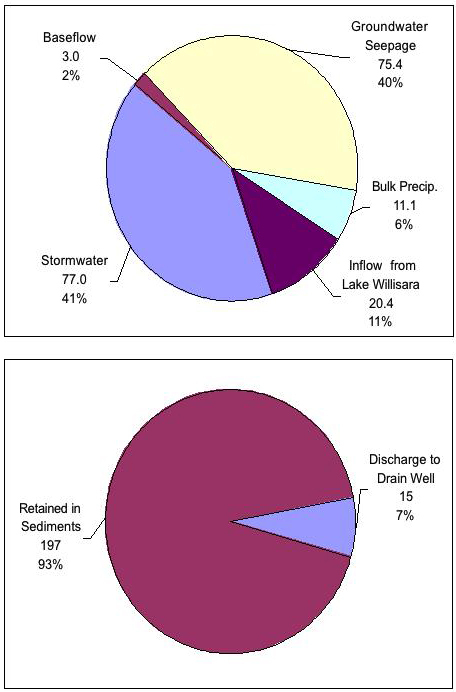 Options for stormwater treatment are evaluated for the two sub-basin areas with the greatest phosphorus loadings, including conceptual designs, and construction and O&M costs. The feasibility of sediment inactivation was also evaluated as a phosphorus load reduction alternative. The evaluated options included additional stormwater treatment within the basin, aeration of deeper areas of the lake, as well as an in-lake treatment system involving the addition of liquid alum into the lake on a continuous basis. Recommendations concerning the optimum water quality improvements were provided. Draft and final reports were prepared and provided to OCEPD and the City.